Welcome to Bobb Chiropractic Center! 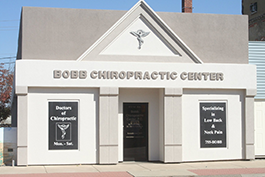 Bobb Chiropractic Center has been providing top quality care to the residents of Silvis and the Quad Cities. At our conveniently located practice you will find a comfortable environment, modern equipment are available six days a week to serve all your healthcare needs. Our mission is to provide you with the most comprehensive, personalized, and caring treatment available anywhere. Our multi-generational family practice offers care to people of all ages. From infants to the elderly we promote health and an active lifestyle. Our goal is to find the underlying cause of any pain or health concern allowing us to treat the whole person, not the symptoms. Our friendly staff assists Dr. Lemke with patient histories, massage, and other therapy work. They are extremely knowledgeable and educated in all phases of chiropractic care as well as insurance protocols to help keep our care affordable. We are available six days a week to make the care our patients need available when they need it. Find out how you can benefit from chiropractic care. Take some time to review our site, and call us with any questions you might have.